Be the bell at the ball with this gorgeous statement piece. 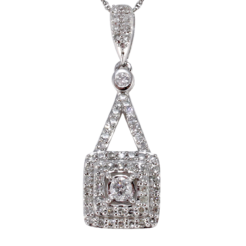 This lariat necklace contains 1.15cts of diamonds that are “H-I” (near colorless) in color and “SI” (slightly included) in clarity. They are set in 14kt White Gold.